Gmail makes the communication between people more convenient as it has the function of saving the contacts when people send emails using their Android cell phone. In this case, some users may want to sync contacts from Gmail to Android cell phone. So in this article, we will show you easy methods to copy Gmail contacts to Android in several steps. Now you can keep reading and get those skills. Part 1. How to Sync Gmail Contacts with Android Devices Directly? Additional Tip: How to Backup Android Contacts to Gmail within Few Clicks? Step 1. Unlock your Android phone and enter the "Settings" on the device. Step 2. Choose "Accounts & Sync" under the "Settings" section and elect the "Add account" option. Step 3. Tap "Google" from the list and click the "Next" button to go to the next interface. Step 4. Hit the "Sign in" button if you already have a Google account and then enter your username and password. If not, you need to create a Google account at first. Step 5. After entering your Google account, you can see there are many file types under the "Sync" setting. Just mark the "Contacts" option to activate the contact synchronization. Here, you can also tick off other options to sync the files. How to Remove Gmail Account from Android? How to Reset Gmail Password on Android in Less Than 5 Minutes? How to Transfer Contacts from Gmail to Android with MobiKin Android Assistant? 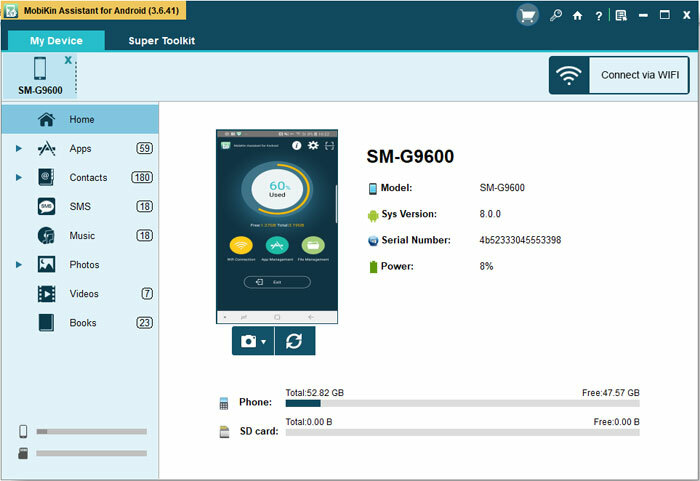 MobiKin Assistant for Android (Windows/Mac) is a management tool for Android users, which can help users to manage different kinds of files on the desktop computer well. And one of its main functions is "Import". This function enables you to import Gmail contacts to Android within few clicks. But before that, you need to copy the Gmail contacts to computer first. Step 1. Login to your Gmail account on the computer, then go to "Contacts" menu on the left panel. Step 2. Choose the button of "More" and click "Export..." option in the drop-down list. Step 3. Here, you can choose "All Contacts" and tick the output format "vCard". After that, you can tap on "Export" button to save the Gmail contacts on desktop computer as .vcf. Step 5. After the recognition, you should go on to select "Contacts" in the left side, and you'll see the detailed contacts info on your Android device. Step 6. Click on "Import" button and choose the "Import vCard file (*.vcf)" for importing to your Android device. For iPhone users, you can click to learn the details about transferring Gmail Contacts to iPhone. How to Backup Android Contacts to Gmail? Step 1. Go to "Settings" > "Account & Sync" > "Google". Step 2. Login to your Gmail and then slide the "Contacts" button to the "On" position to complete the syncing process. Step 1. Download, install and launch the program on your computer. Then connect your Android phone to computer via USB cable and go with the on-screen prompts to make the connected device be recognized. Step 2. Now the parameter and files of your device will be listed on the program. Just click the "Contact" folder and preview the specific items on the right panel, then you can mark those you want to copy and hit "Export" and choose "Export to VCF". After that, the selected contacts will be saved to PC as .vcf files. Step 3. Open and login to your Gmail account on your computer, then select "Contacts" in the left side. Next, you need to tap on "More..." button on the right side and click "Import..." option to load the .vcf file into your Gmail account easily. Except for contacts, you can also backup other files like text messages, App data, etc. to Gmail. These are two effective ways to sync contacts from Gmail to Android. You can choose the one you like to complete the Google contacts sync. As for the users who want to backup the Android contacts, you can also get the methods from the tutorial. Now just take action to sync your Gmail or Android contacts.